Bending Flexibility - A relative measure of how flexible one shaft is compared to another. It is the inverse of "Bending Stiffness" multiplied by 100 for convenience. The higher the "Bending Flexibility," the lower the "Torque To Rotate (TTR)." The lower the "Bending Stiffness," the lower the "torque to rotate." Bi-Directional Steady-Flex® Shafts - These Flexible Shafts are designed to operate in both directions. The performances of bi-directional shafts in the "LOL (Loosen Outer Layer)" as well as "TOL (Tighten Outer Layer)" directions will be closer to each other than would be the case with a uni-directional shaft. Bi-directional Flexible Shafts typically have more layers comprised of smaller diameter wires than a uni-directional shaft. Differential Torque to Rotate (DTTR) - This is the difference between the high and low values of TTR (Torque To Rotate) when a shaft is rotated 360 degrees. It is a measurement of how smoothly a shaft runs. Direction of Operation - This is the direction in which the shaft rotates: Clockwise or Anti-Clockwise (counter-clockwise), as viewed from the driving end of the shaft looking toward the driven end. Dynamic Torque Capacity - This is the term for maximum recommended torque, when shafts are operated at higher than 100 RPM's. This is a function of the operating radius of curvature. Helixing - This is the phenomena where the central axis of the shaft twists itself in a helical or corkscrew shape upon the application of sufficient torque. As the torque continues to increase, the degree of helix becomes more severe. An outer casing can limit the degree of Helixing. Loosen Outer Layer (LOL) - When the Flexible Shaft is twisted in the direction opposite to its outer winding, the outer wind wires loosen and open up. Manual Torque Capacity - The maximum recommended torque when shafts are operated manually, or at less than 100 RPM's. The values are typically twice as high as the Dynamic Torque Capacity since "fatigue life" is generally not a consideration. Minimum Operating Radius - This is the smallest radius a Flexible Shaft can operate in, without externally applied torsional load, and retain its normal life expectancy. Non Damaging Radius - This is the smallest safe radiusto which a Flexible Shaft can be bent into without permanent deformation or damage. SAFE Operating Speed - When a shaft is operated, heat is produced from two sources: heat from internal friction when the shaft's wires rub against each other; and heat from external friction when the shaft rubs against the inside of its casing. maximum RPM=(500 x 12)/∏ x dia. Tighten Outer Layer (TOL) - When the shaft is twisted in the same direction as its winding, the outer layer of the shaft compresses and tightens down on the rest of the shaft. As a rule, a Flexible Shaft operated in the TOL direction performs better than do those operated in the LOL direction. Torque to Rotate (TTR) - Flexible Shafts exhibit internal friction which increases as the radius of operation decreases. The TTR is the torque required to overcome the resistance due to this friction. The TTR value is always specified for a specific radius of operation. Torque capacity - This is the maximum torque that can be applied to a Flexible Shaft on a continual basis and still maintain a normally expected fatigue life. Torque Capacity will vary with the operating radius of curvature, as the radius decreases so will the Torque Capacity. For dynamic applications, the value is typically 25% of the UTS, when operated in a straight or almost straight condition. It is derated from this value as the operating radius decreases. Torsional Stiffness - The measure of the resistance of a shaft to a twisting or torsional force expressed in units of in.-lb./Rad./in. The value will be higher in the TOL direction of applied torque than in the LOL direction. Since the purpose of a Flexible Shaft is to accurately transmit rotary motion with minimum twisting, a high Torsional Stiffness value is generally desirable. Ultimate Torsional Strength (UTS) - Is the maximum torque a Flexible Shaft can withstand before breaking. The UTS will be different for the TOL and LOL directions. 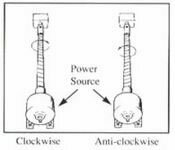 Uni-Directional Power-Flex® Shafts - These Flexible Shafts are designed to operate predominantly in one direction of operation only - either clockwise or anti-clockwise. Each shaft is stronger and torsionally stiffer in one direction of operation than it is in the other. The stronger direction is always the TOL direction.